Lauren holds a BA in Music Performance from Southern Oregon University and a Music Education degree from the University of Oregon. She then pursued long-term Suzuki training from John Kendall at the Suzuki Institute at Southern Illinois University-Edwardsville. Moving to Anchorage, Alaska in the 90’s, she taught private lessons and performed with the Anchorage Symphony, Anchorage Opera Orchestra, and Anchorage Ballet. Returning to Portland, OR she taught at the Community Music Center and performed with the Columbia Symphony, the Newport Symphony, Vancouver (WA) Symphony and as an active freelance union musician. 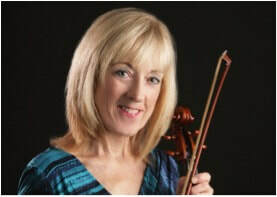 In 2005 Lauren moved to Seattle and started teaching at Music Center of the Northwest, where she became the Coordinator for the Suzuki Academy within the school and helped build a strong and reputable Suzuki program there. During her twelve years at Music Center she performed with Seattle Philharmonic Orchestra, Philharmonia Northwest, and Orchestra Seattle and Seattle Chamber Singers (OSSCS). She also taught an amateur adult string group, as well as student ensemble classes. She is an active member of the Suzuki Association of the Americas and the Suzuki Association of Washington State, where she holds leadership roles. She is very excited about establishing a studio in Mt. Vernon and Bellingham and sharing her love of music and teaching with this community.